Koble til igjen med naturen på en sjarmerende gård i kystnære Maine. Ved siden av en vakker bekke omgitt av mark og skog, vil du luxuriate i king size-senger, nyte fantastisk utsikt og intime, rolige rom. Denne nye, lyse og koselige tømmerrammen hytte ligger bare en kilometer fra alle butikker og bekvemmeligheter av Blue Hill, som ligger sentralt til Acadia National Park, Camden, Belfast og Stonington. En perfekt ferie fra en hektisk verden. Sitt ved bekken, les en bok, ta den lange forfalskede lur. Massevis av bøker, brettspill og leker for barn. Hvis du besøker med små barn, har vi trappporter, en spedbarnstol, plastplater, kopper og en bærbar krybbe tilgjengelig for din bruk. Maksimal innkvartering av hytta er seks (6) gjester: (2) King size-senger i tillegg til to (2) deluxe disk-0-sengs barnesenger (med puter, laken, tepper). Vår 4-sesongen Hytte ligger på Misty Morning Farm som reiser griser, høner, bier, frukttrær og grønnsaker. Hytta ligger ved siden av bekken, borte fra den daglige gårdsaktiviteten, og gjestene er velkomne til å se seg om resten av gården i dagtid (vennligst ikke inn i noen bygninger eller dyreluft). Gjester har valg av selvkontroll i eller oss som møter deg. Døren har en digital kode deadbolt. Gjester får en unik 4-sifret kode for oppholdet. Vi liker å møte mennesker, men vi respekterer også ditt privatliv. Hytta har trapper (med rekkverk) som forbinder alle tre etasjer. Vi reiser bier på gården, så vær oppmerksom på om du er allergisk. Hytta har wifi og bluetooth høyttalere for din personlige musikk. Hytte har med vilje ingen TV. Ingen kjæledyr / service / støtte dyr tillatt. Gjestene har tilgang til vår nye låve ved siden av hytta som har en regulering ping-pong bord, basketball hoop og ring kaste. Dette er et utmerket rekreasjonsrom for hele familien. I can't imagine a more perfect HomeAway experience than our stay at this cottage. The space itself is all we could ask for and more. While it may look small, it LIVES large. The inside is perfectly designed to maximize space and the aesthetics of natural wood beamed ceilings and white walls will give you a Scandinavian feel. Even the artwork is perfectly chosen to create a serene experience. 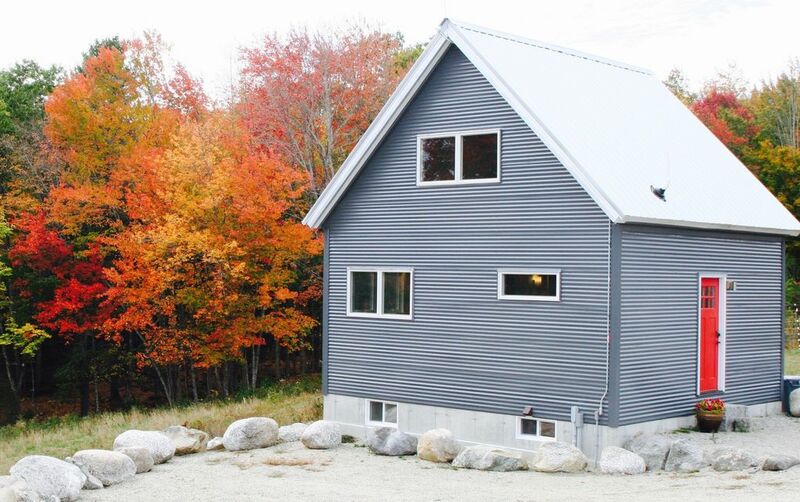 The cottage is a masterpiece of environmentally friendly architectural design. Even better was the thoughtfulness of our hosts. On arrival we were greeted with a bowl of fresh eggs, a bottle of pure maple syrup and a jar of homemade blueberry jam...all produced on the farm. There was even a surprise for our five year old daughter addressed to her by name. Forgot to buy coffee at the store? No worries, there are freshly ground beans on the counter. Filters? They are there too. How about a cup of tea? Yup. Everything has been thought of. We were lucky enough to have some significant snow during our late November stay. Without even being asked our hosts dropped off a sled for our daughter and gave us directions to the two best sledding hills in town. The entire experience was one of extraordinary care and thoughtfulness. I can't recommend it enough. My mother came in from Wisconsin to visit the East Coast and we decided to stay at this beautiful exposed wood beam cottage. The cottage sits on a small farm and the friendly pigs always greeted us when we stepped outside. We went hiking in the back woods and the running stream made for amazing fall pictures. The abundance of books made for a relaxing time away from technology. This cottage looks deceiving from the outside in size but its very roomy inside with beautiful exposed wood beams and hardwood floors. This cottage is perfect for 2 couples or 4 people total in size. Thank you Sean for opening your beautiful cottage to us, will definitely rent again. Centrally located, but the feel of a secluded retreat. Can’t wait for a return trip! From the clean and spacious cabin, to the brookside seating areas, the owners have thought of just about every detail to make for a comfortable and memorable stay. First, I would like to compliment Sean on his speedy communication and quick replies. My husband and I were looking for a long weekend get away in Maine. It has always been on our bucket list. We found the pictures and description of the cottage to be just adorable and what we were needing for the weekend. The pictures and descriptions were EXACTLY what we saw and read. The cottage was clean, bright, and very well insulated (we are from Florida so we very much appreciate a well insulated place). The jam and eggs left as complimentary welcome gifts were amazing. We also tried the apple butter and syrup that were also made on the farm, which too were amazing. The pigs, chickens, and turkeys on property were just a joy to watch. Blue Hill is a good spot for day trips to Bar Harbour and Acadia National Park as well as Deer Isle and Stonington. We would highly recommend this chic cozy cottage as it was very comfortable, clean, in a good location, and Sean was a joy to communicate with. We missed him by just a few minutes but would have loved to have met him and learn more about his farm. We thoroughly enjoyed our stay at the property! The cabin was beautiful and the location was quite peaceful. We arrived late at night and it took several attempts to find the property from the roadway. I’m sure had we arrived during daylight hours it would be easier. The homemade jam and farm eggs were a very nice touch. We would definitely stay here again. Having rented a number of properties through Homeaway/VRBO and Airbnb I can unequivocally say that the cottage at Misty Morning Farm was our best experience to date. While the listing description is accurate, it somehow doesn't to justice to how good it feels to be here....we found ourselves ending our excursions into the countryside a bit earlier every day just to come back and relax in or around the cottage and prepare meals in the well-appointed kitchen. Both beds were very comfortable and and provided all of us with a good night's sleep. Although we never met the Dooleys in person, Sean was attentive to our requests and very helpful in tracking down a package we had sent to the farm. If we find ourselves traveling to this part of the country in the future we will definitely try to rent this cottage again. Blue Hill Village ligger en kilometer unna hytta, og der finner du dagligvarer, øl / vin / brennevin, postkontor, butikker, gallerier, bibliotek, rådhus, museer i byen, kirker, byarrangementer og mye mer. Acadia National Park er 30 miles, Stonington er 15 miles, Belfast er 35 miles, Camden er 50 miles, Bangor er 35 miles ..
Check-in anytime after 3pm. Checkout 10am. Cottage has a 4-digit electronic deadbolt lock and your entry code is last 4 digits of your tel #.